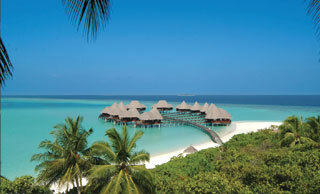 ::Coco Palm Dhuni Kolhu Island, Baa Atoll, Republic of Maldives | Luxury Holidays Indian Ocean | Island Pearl Holidays Maldives - Coco Palm Boduhithi Maldives, is a majestic island resort. Built in a traditional village style with charmingly decorated thatched beachside bungalows, the resort is set within lush palms and mangroves bordered by soft sands. Enjoy endless views across the sea from your private, luxuriously appointed villa, and stimulate your senses with sublime Asian cuisine, first-class spa facilities and unparalleled diving opportunities. Surrounded by breathtaking scenery and the shocking turquoise of the Indian Ocean, Coco Palm extends an invitation to privacy and seclusion, where relaxation is deliciously inescapable.Leisure and comfort come together luxuriously in the open layout of each villa. Natural textures and private outdoor spaces create an environment of utter relaxation. Sundecks lead to private pools and daybeds for privacy. Follow sandy paths to the beach, where every water sport imaginable is available. Snorkeling, scuba diving, sailing, canoeing, windsurfing, water skiing, or fishing, allow you to be at one with the crystal clear ocean. On land, enjoy unforgettable treatments of the Coco Spa, or the sumptuous cuisine at one of several beachside restaurants. In villa dining is available for those who have found paradise on their own private sundeck. Designed to create a level of relaxation rarely found in our modern world, Coco Palm invites you to take a deep breath, and exhale. BEACH VILLAS – 87 sq.m. Beach front rooms with king size bed Open air private bathroom with shower and fresh hot and cold water. Personal safe, minibar, tea/coffee maker, Hair dryer and laundry service Sitting area, writing desk & IDD telephone, Air-conditioning and overhead fan. Private terrace with outdoor seating. 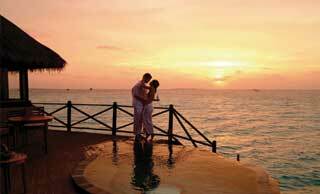 DELUXE VILLAS with Plunge Pool – 87 sq.m Beach front with four poster king size bed. Open air private garden, bathroom with sunken bath in garden, shower, fresh hot and cold water. Mini bar, tea/coffee maker, personal safe, hair dryer and laundry service. Sitting area, writing desk, and IDD telephone. Air-conditioning and overhead fan, private terrace with sunken fresh water plunge pool and outdoor seating. LAGOON VILLAS with splash pool – 87 sq.m. Over-the-Lagoon rooms with four poster king size bed. Uniquely designed Ocean view luxurious bathrooms with complete “outdoor” atmosphere and absolute privacy. Deluxe spa bath, shower, fresh hot & cold water. Personal safe, mini bar, tea/coffee maker, hair dryer and laundry service.. Sitting area, writing desk & IDD telephone. Air-conditioning and overhead fan. Private terrace with sunken fresh water splash pool over the lagoon and outdoor seating. LAGOON PALACE SUITES with Spladh Pool– 154 sq.m. 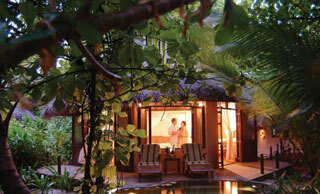 Over-the-lagoon suites with a spacious bedroom and sitting room. Bedroom with four poster king size bed. Uniquely designed Ocean view luxurious bathrooms with complete “outdoor” atmosphere and absolute privacy. Deluxe spa bath, shower, fresh hot & cold water. Mini Bar, tea/coffee maker, personal safe, hair dryer, laundry service, writing desk & IDD telephone. Air- conditioning and overhead fan. Private terrace with large sunken fresh water splash pool over the lagoon and outdoor seating. COWRIE RESTAURANT; International Cuisine – Buffet and Set Menus – Action & Display Cooking. 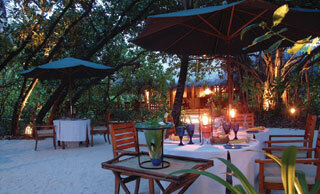 CORNUS RESTAURANT: Romantic dining in a garden setting under the stars or in a Maldivian Style open air restaurant. This specialty dining venue serving dishes from Maldives , Thailand, India , as well as other Asian delicacies. CORNUS GRILL: Open air grill serving freshly grilled Fish and Seafood. CONCH BAR: Set on the beach facing sunset and a panoramic view of The lagoon serving a large selection of beverage and snacks. LAGOON BAR; Built on stilts over the lagoon with a wet area for swimmers, a wading area for romantic sunsets, and a dry area for a limited selection of drinks. IN VILLA DINING: Personal service in the privacy of your villa. Breakfasts and a selection of In Villa Dining offerings. 24-hour Reception, Multilingual staff, Foreign currency exchange, Boutiques, Laundry and Valet service, IDD telephone service, High-speed Internet connection. NAUTILUS SPA: A total sensory experience, The all natural treatments draw on the ancient health and beauty traditions of Asia , that celebrate beauty and refinement and honour nature's precious gifts. Indoor games, Table tennis, Badminton, Tennis, Volleyball, Billiards table, Gym, Aerobics, Audio visual room, Bar and jacuzzi, International diving school of the highest standard offering PADI courses, Catamaran, windsurfing, water skiing and sailing.